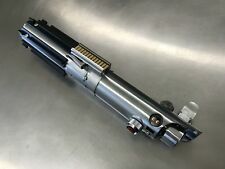 Graflex 2.0 lightsaber prop hilt. Full size replica prop. A great prop at a great price. ESB blade tension screw included. Anodized red button covers. MPP 2.0 Vader Stunt lightsaber prop hilt set. A great prop set at a great price. 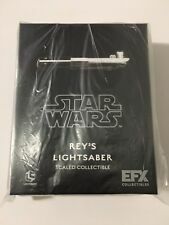 Rey's Lightsaber Scaled Replica Star Wars Last Jedi EFX Collectible from Loot Crate DX. Brand New mint in box and original unopened plastic. The range finder parts have been included in the kit, but not permanently attached. ( the First picture has visor lens in place for reference to show darkness of lens). Pre-cut visor lens smoke color (black). LOT OF 2 STAR WARS SABERS FX SOUND LIGHTSABER LIGHT SABER SWORD TOY - NICE GIFT! CHANGES COLOR AND MAKES FX SOUNDS WHEN STRUCKS OR SWINGS! SOUND FX AND CHANGES COLOR. LOT OF 2 - STAR WARS LIGHTSABERS. Total length from bottom of hilt to tip of blade is 27.5". Blade itself is 18.5". 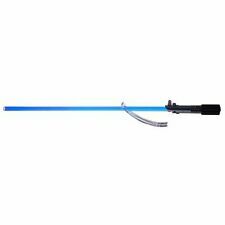 4.5 out of 5 stars - LOT OF 2 STAR WARS SABERS FX SOUND LIGHTSABER LIGHT SABER SWORD TOY - NICE GIFT! 119 product ratings119 product ratings - LOT OF 2 STAR WARS SABERS FX SOUND LIGHTSABER LIGHT SABER SWORD TOY - NICE GIFT! Hasbro Star Wars Black Series Light Up Lightsaber Force FX Luke Skywalker 2017. Condition is New. Shipped with USPS Priority Mail. Ships DOUBLE BOXED so Brown Hot Toys Box is protected! Darth Vader ~ A1190. Star Wars Rebels. For ages 4 and up. DOES NOT light up. Le ngth when closed/when extended: approx. 11.25" / 32.5". Collect them all, and start your collection right here! Ages 8 and up. Lot numbers may vary. Gender: Male. Photos are. Star wars Episode ESB: Luke Skywalker's Lightsaber! This model has a pull off grip section reveal chamber where you can see the lightsaber crystal chamber. Star Wars is more than a movie. In addition, the front of each card portrays the Star Wars Characters in raised relief on Gold Leaf. Each card is numbered and limited of 10,000. This complete 9-card set features all of the greatest early Star Wars characters in the universe. From 1977.now 41 years old. Patch has a glue backing, so it can be ironed on or sewn. Stamped steel Graflex clamp replica with stainless steel long lever as found on the Skywalker / Kenobi stunt lightsaber. - clamp DOES NOT have the word “GRAFLEX” embossed on the body. - clamp fits 1 1/2” body. Accurate 3D printed replica code cylinders. Good for either TIE or X-wing pilots, and some other officer costumes. Color of the printed material will vary, I usually print them in either white or gray, but you will want to paint them silver anyway. They were difficult to find and very limited. STAR WARS MACE WINDU PURPLE LIGHTSABER. No Jedi master is complete without a trusty lightsaber. wrist to almost 3-feet (91.5 cm) in length, and recedes into base for storage. GET IT FAST! 3d printed 2pc lightsaber mount. Printed in PETG so its SUPER strong and sturdy. (BUY 2 AND WE WILL SEND YOU A 3RD FREE), MIX AND MATCH COLORS. Bottom base mount. Blade Mount is Available in 1" or 7/8". Collect them all, and start your collection right here! Ages 8 and up. Condition as seen in the photos. You will not find another fully assembled ready-to-install Hovi Mic Tip set of this quality at this price anywhere. HOVI MIC TIP SET OF 2. Full-face respirators, these units are VOICE AMPLIFIERS, NOT VOICE CHANGERS. 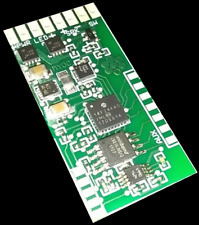 SEA SmallTalk ST2 Voice Communication. See below for the manufacturer specs. Voice communication device for effective speech while wearing an SEA full face masks, model FP. STAR WARS MILLINIUM FALCON. ♥♥ "Im a partner in hope with St jude hospital so all my sales. No detail has been overlooked. Give us a shot and we will make sure that you will look to us again! Make sure this fits. by entering your model number. You're already purchasing the item. Item model number: 80801. 1977 vintage MEAD portfolio Star Wars STORE DIPLAY box w/ 3 folders Leia VADER+! 3 folders and original counter top display box! Disney Star Wars Kylo Ren Two Piece Adult Mask Become a follower of the dark side! Includes: 2 piece character helmet. Available Sizes: One size fits most adults This is an officially licensed Star Wars Episode VII The Force Awakens product. Size: H85CM. 85CM Star Wars 1/1 Life Size Master Yoda Statue. - 1 x Star Wars 1/1 Life Size Master Yoda Statue. We will try our best to reduce the risk of the custom duties. Detail Image. Star Wars Force AwakensStormtrooper Deluxe Child Helmet Serve Captain Phasma and The First Order! Includes: 2 piece white helmet. Available Sizes: One size fits most children This is an officially licensed Star Wars Episode VII The Force Awakens product. This is a 3D printed DL-44 Blaster kit for the ANH version blaster. The colors are spectacular. TITLE:Star Wars May The Force be With You . Original 1977 - STAR WARS - Movie Theater Premiere SOUVENIR PROGRAM . Condition is Used. Shipped with USPS First Class Package. Blue LIGHTSABER like in Star Wars with Sound - Batteries Included. The Complete Star Wars Trilogy. An expanded version of the originalStar Wars trilogy was produced in 1981, 1983, and 1996. Original Radio Drama Series. Episode title List IF You are a Star Wars fan and have not heard THIS Radio Series -. The DL-44 heavy blaster pistol was a type of heavy blaster pistol produced by BlasTech Industries that was used during the years of the Galactic Republic and the Age of the Empire. The DL-44 was a powerful, highly modifiable and accurate blaster pistol. High quality clear Acrylic Lightsaber stand at super price! Lightsaber not included. Laser cut to give you the best render in the galaxy. Up for sale is a nice looking and hard to find R2-D2 Taiwan 12 cardback C with attached bubble complete with footer. The cardback is in nice condition. There is one vein at the top front left corner that has not broken the color. Get them all at once in a cool retro Kenner-inspired box and show off your "geek cred" for all to see! Even if you did not collect the toy line, these pins are epic and charming in their historical significance and design. This Kit includes 2 Blaster Power Cells, and one Cylinder. Everything you need to complete your ANH Han Solo Screen Accurate Belt. Make your belt as accurate as can be with both Kits! The Power Cells are Solid White in Color! Condition is Used but a ll of themlooks b r a n d n e w. T h e r e a r e 1 2 t o t a l s o i f you a r e w a n t i n g t o b u y m u l t i p l e s p l e a s e s e n d o f f e r s. Al l gl as se s wi ll b e sh ip pe d in a b ox w it h ca re t o en su re i t is n ot b ro ke n in t ra ns po rt. New! SDCC 2018! Hasbro HAN SOLO EXOGORTH ESCAPE Star Wars ESB Black Series! Over the years, the Star Wars franchise has produced a vast array of toys and collectibles. Whether for display or actual play, there are collectible options for all fans of the series. eBay offers an excellent selection of Star Wars collectibles to find one that meets your needs and budget. What types of lightsaber are there? Force FX - The Force FX features a premium blade and motion-sensitive lights and sounds. Blade Builders - Blade Builders toys allow you to create your own saber using your choice of color and hilt. Graflex - These are detailed replicas of lightsabers found in the Star Wars movies. These are usually made from metal. What are some Star Wars figures found on eBay? For every Star Wars character, there is an action figure. There are action figures for main characters, like Luke Skywalker, Darth Vader, Princess Leia, and Han Solo, as well as obscure figures like Max Rebo. There are Star Wars action figures made by various companies, dating back as far as the original trilogy. Some companies that make Star Wars figures include Kenner, Gentle Giant Ltd., and Hasbro. There are also LEGO sets that include character minifigures and vehicles. What costumes and masks can you find? There are a wide variety of costumes, masks and costume parts you can find on eBay. For example, you can find voice amplifiers and voice changers to make you sound like Darth Vader. You can also find character masks for Chewbacca, Argus the Six-Eyed, Ellis Asly, Admiral Ackbar, and many more. You can even find cooling systems to help you stay comfortable in a full costume. 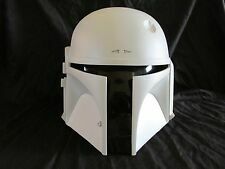 What other Star Wars collectibles can be found on eBay? Helmets: You can find collector's helmets for some of the major figures and forces, including Darth Vader, Stormtroopers, Boba Fett, and Kylo Ren. Posters: You can find multiple posters for each of the films, including "The Force Awakens." There are also art prints that can you hang on your wall. Pins and patches: The Star Wars franchise has many pins and patches you can collect and use. They feature a variety of characters and vehicles, including Luke Skywalker, Chewbacca, the Millennium Falcon, and Mace Windu. Content provided for informational purposes only. eBay is not affiliated with or endorsed by Disney or Lucasarts.